Ylang Ylang oil is distilled from the early morning freshly-picked flowers of the Cananga tree. It has an intense, floral, sweet, jasmine-like fragrance and is sensual, euphoric and an antidepressant. 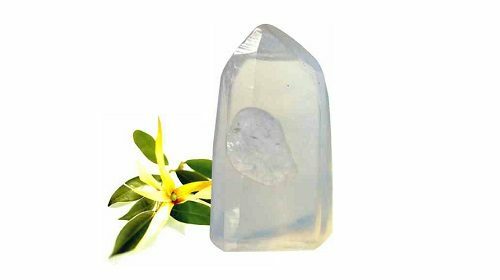 Clear Quartz increases wisdom, clarity of thought and emotions. It enhances memory, meditation skills and attunes one to their spiritual purpose. Each one off these soaps are as unique as you are as nature helped with the forming off the crystal gemstones.